After working over 12 years as a graphic designer and image editor, Ina Prodanova applied her bold sense of style and affinity for art in a sustainable jewelry design. Prodanova makes playful jewellery that is full of personality and fun to wear. 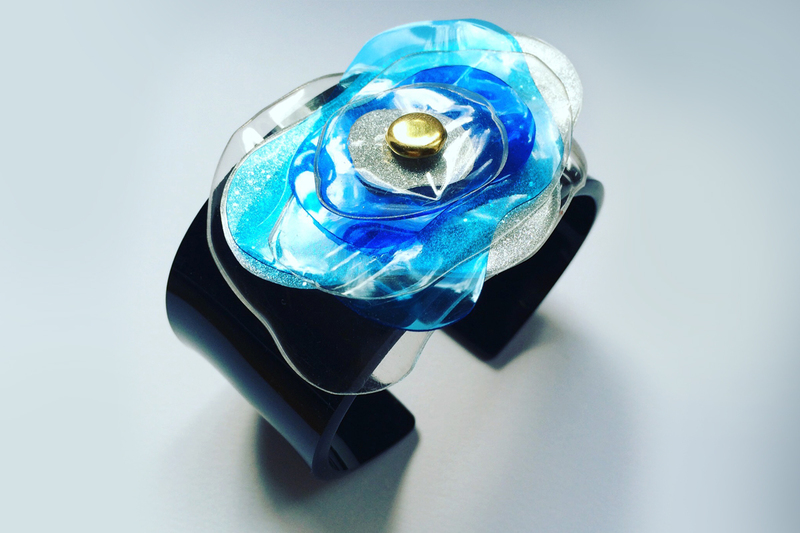 She spent a year and a half creating her first jewellery collection before starting her ENNA brand of up-cycled plastic accessories—wearable jewellery made out of plastic bottles. We have managed to catch up with Ina and ask some questions to get to know her brand better. Your name and where you’re from? My name is Ina Prodanova and I am a Bulgaria native. I was born in Rousse; one of the biggest and most beautiful cities in Bulgaria. In my 20’s I relocated to Veliko Tarnovo to study Graphic Arts for 5 years before moving to the capital, Sofia to finish my Master’s Degree in Visual Communications. I love the adaptation process that allows me to follow my passions and, taught me how to deal with tough situations. Most importantly, it helped me to gain inspiration for future projects. Tell me what you do and how you got there. When did you first discover that you wanted to be an up-cycled jewelry designer? As a creative person with a bold personality, I have always been fascinated with making something out of nothing. I have the imagination and the skills to create different objects from something I no longer use. I remember in my early years how many necklaces, earrings..most of my mother’s jewellery was altered by me. Today, she would say ‘destroyed’ but she never said a word at that time – thank you for that mom! I wanted to make something unique to wear; I wanted to explore and learn how to create beautiful jewellery you cannot find anywhere else. Most of them were unsuccessful of course / she laughs /. Anyway, making jewellery remained a hobby and has always been part of my life. But, I didn’t like the mass produced pieces and this pushed me to look for different ways to express my personal style. This is where the plastic bottles took place. These plastic flowers are so charming and I began to try more ways to implement them into my designs while still keeping the design simple. I felt great pride wearing sustainable pieces that caught so many eyes, which is the moment I realized I was on the right track. Up-cycled jewellery was the best way I could express myself. A few months ago, I decided to open the ENNA Up-cycled Plastic Jewellery Etsy store /a bit later in life/ and it was and still is a big journey. There are so many things to learn. This is something that makes me happy and I want to keep that feeling. Creating jewellery, thinking of social media updates, constantly looking to gain experience while working part time and taking care of a two year old, lively boy while simultaneously building my collection one piece at a time on my kitchen table. Before I acquired the right tools and equipment, it was overwhelming. But, I see the improvements and this is what has kept me well focused. 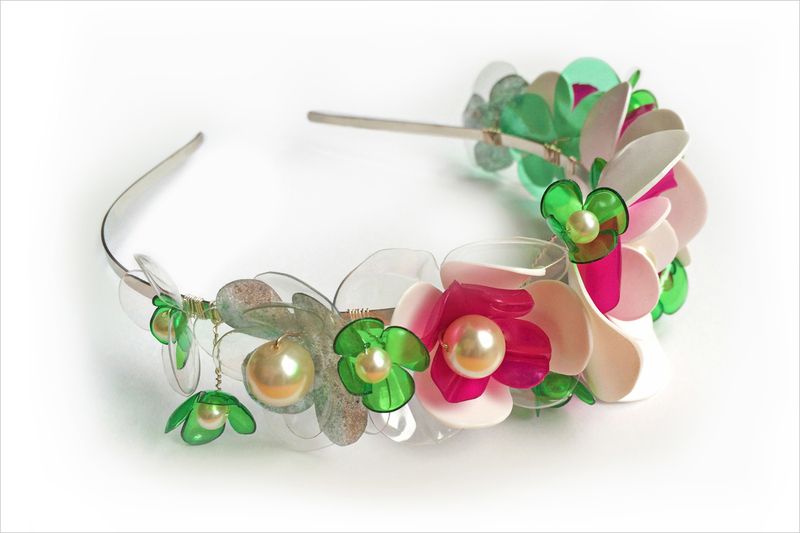 What made you decide to focus on making jewellery out of plastic bottles? I wanted to make a difference in the world, in a creative way. 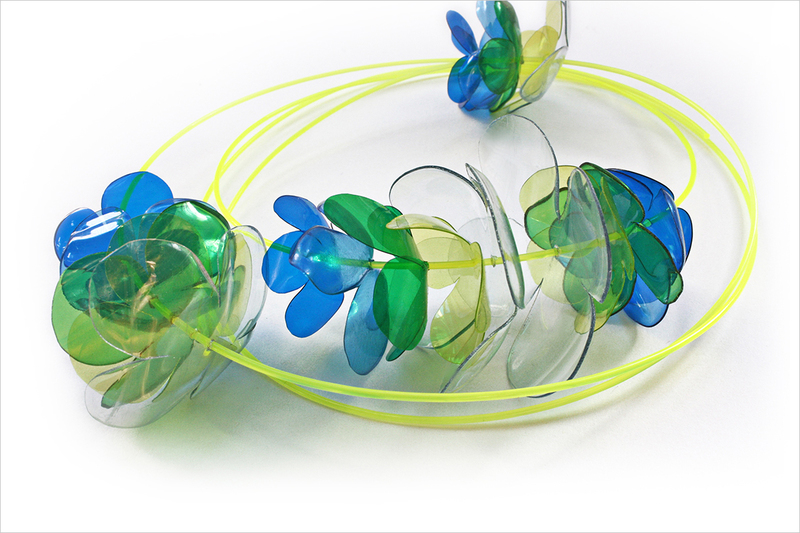 The idea for the plastic bottles came from а creative impulse when I was making my own jewellery once. I liked the material. It seemed so unusual, it melted so beautifully and somehow gave a 3D quality, so I decided this must be the direction to go for. I started to look for a different coloured bottles, at the shores, on the street. We throw an astonishing amount of plastic and packaging into the landfills each year. Up-cycling is an ecological way to reuse unwanted items, to give them a new life and purpose. It simply requires your own creative approach and passion for making beautiful things. Tell us about your unique design style and what is your favourite thing about your brand? My design style is modern, elegant and feminine, as I always use flowers. My work usually combines the look and the feel of femininity; something that’s edgy, but still classic. I love nature and this is what I most miss from my country. I also have an acrylic line in geometric forms; contrasting elements, like gold finishing. Every piece is cut and polished by hand as I admire the feeling of something that was made with care and attention. Each person deserves that and that helps people express their individuality. There’s something personal and intimate about this. Women who usually want something a little different, to distinguish themselves from the crowd; people that have their own style and environmentally friendly lifestyle. They usually travel a lot, people with artistic flair that have many handmade products at home. They want to express their taste and themselves rather than following a label or a trend. These women are brave, well educated and know exactly what they like and want. As a creative person, designer where do you draw your inspiration from? Oh, that nature! From nature and definitely from flowers! I won’t lie if I say that I really miss my country’s nature. I used to go to the Rila mountain where I climbed a peak, even only for a short walk. The feeling of being part of the universe, just sitting in silence and listen to nature’s sounds inspires me and gives me the energy and the feeling that everything is possible in this world. Otherwise, many visual details can influence my work. I’m also attracted to geometric forms and architectural elements. It often happens that I pick out certain details from a building and be influenced by it. What advice would you give to someone that is getting into the jewelry business?